5th JUNE 1915: ‘SOMEHOW I DON’T FEEL QUITE HAPPY’. 5 th June, Sat. In Hutments, Bulford Camp. Proceeded to Trenches in relief 6th Souths. Pte BERTIE HIBBETT: LETTER to IDA HIBBETT, 95, Foden Rd. Walsall. 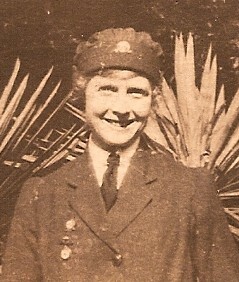 IDA HIBBETT VAD Nurse. 27yrs. Saturday May June 5th / 15. I have addressed this to you for a reason, I should not like Mother to know, but I know you will take it in a stronger light. Somehow I don’t feel quite happy; what causes it puzzles me. Whether it was the bananas that spoiled all the lovely contents of the parcel; whether it was because I’ve had to borrow got no paper of my own to acknowledge the topping comforts & had to borrow this from Vernon who is lying with me on the grass listening to the army band playing waltzes – whether it’s because the latter is somewhat sentimental music or what. Could it be homesickness? How its come about I don’t know, but there it is. Perhaps it is very likely with regard to acknowledging this ripping parcel with topping comforts. So I will set my pencil to work – not my pencil – there it goes again, its a borrowed pencil – Ah perhaps its because I keep writing to you to send so many articles. Syd(ney), I at any rate, was looking forward to this parcel & was anxious about its coming when we shall be in the trenches. Good – how delighted I felt when I saw Dad’s writing on the familiar & usual shape of the hamper. So we shall be able to enjoy the pineapple apricots and cream in the Listeners’ Lounge. Not just because the things are good in themselves, but they will remind us & fill our thoughts of home as well as fill our tummies. Now in my last letter to Mum on King George’s Day I said when I would write the next & would enclose it in green envelope, so no references to the army. Mrs Evans, as Vernon has told me, in every letter she writes to him, wishes to be remembered to Sydney & me. Vernon said he got quite tired of repeating her wishes, – in fact he admitted he had missed more than once to convey them to us. What had we both better do, putting it frankly and squarely? I was in puddle (sic) & made myself foolish, I could not find words in response to Mrs Evans kind wishes. The question arises – shall we write? Sydney, I guess you trust, has acknowledged her fine box of King Edward Chocolates. Tea now. We must arise & then I will put to you another puzzling personal what do you call it. See how adjusted I am, I can’t write properly today. There’s another ten minutes yet so I can go on for that length of time. The Curate* I told you sent me a very nice letter. Where the puzzle comes in is that he mentioned about his son and described an instance very nicely. Now its about his having a son that I’m puzzled about, or rather more strictly how it concerns me. Shall I write & congratulate him, express my pleasure of hearing of the birth or shall I let it slip by? It’s tea time for sure now, so I’m off. Just finished tea. The next puzzle is a practical one. How shall I cram all the rest I want to tell you on this page? I must tell you how I enjoyed the cherry wood pipe with the Lobby’s bacca (?) while with Vernon listening to the band this afternoon. The weather has been hot again & being evening now it is the best part of the day, excepting the time before breakfast. You’ll be amused, like Vernon was, when I now say that I struck more than half a dozen matches to keep the old chimney, no – the new chimney going. Everyone looked at me and made some ‘rude’ remark jokingly. Surely its jolly good of you to send a parcel to Vernon. Alas he’ll have to wait till we come back from the trenches. Harold sent another good box yesterday & you needn’t send a cigarette holder, but I should have liked a white one. Yet the yellow and gold of Harold’s looks ‘pretty’ when the smoke curls in front of my face. We read the letters generally first, before looking into the parcels, because it is the spirit in which they are sent which primarly ? (sic) matters. So it goes without saying I could write twice the length of this letter – to thank Mother & Ida for their lovely homely epistles. PS Another reason why I was not up to the mark today is perhaps I was sorry on hearing about the ‘Syd’ & ‘Bert’. Forgive me but I’m a maddun on cutting words short – ‘he’ll’ in fact means ‘he will’. I will emphasise the ‘ie’ and ‘ney’. I do so hope you will fathom out my writing & forgive my bad expressions. ‘Somehow I don’t feel quite happy’ – Bertie Hibbett is not being ironic. He is genuinely puzzled about his feelings and writes for advice to his Sister, rather than to his Mother. The Letter is written on scruffy paper and his writing is rushed, with lots of crossings out and additions. Postscripts are tucked in at top & bottom of pages and up the sides. In short the letter’s appearance, as well as its content, reflects Bertie’s low spirits. 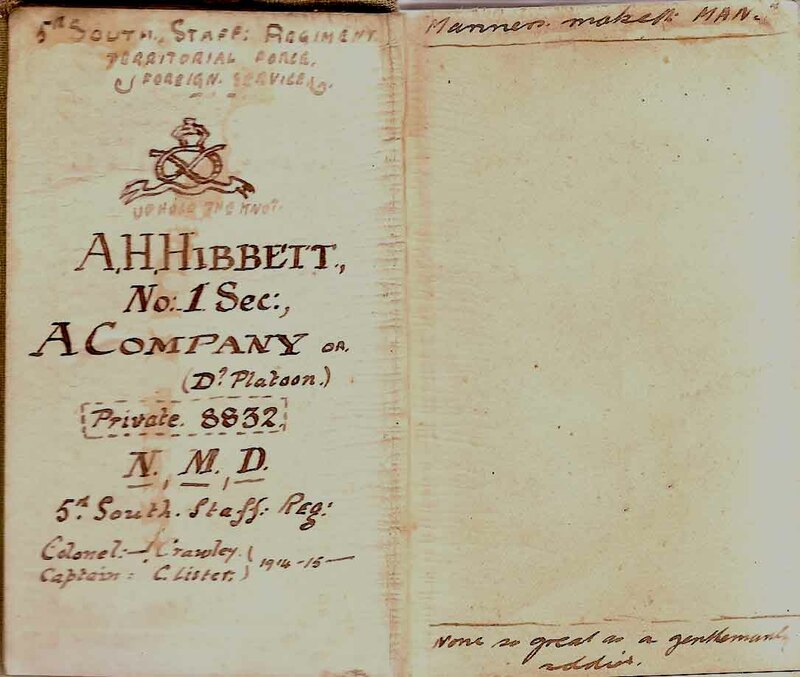 In his copy of A Dictionary of Etiquette by Marjory Luxmore (Cassell’s Pocket Reference Library 1914) Bertie has written the following maxims on the fly cover: ‘Manners maketh MAN’; ‘Follow the example of General Gordon, Earl Roberts, Wellington & Nelson’ and most revealing of all ‘None so great as a Gentleman Soldier‘. One hundred years on we can see Pte Bertie Hibbett is trying to do the impossible under horrendous conditions. He is trying to be a dutiful son. a soldier and a gentleman but he is exhausted in mind and body. In this Letter I see signs of the Shell Shock he suffered from for the rest of his life. NEXT LETTER: 10th JUNE 1915. Dreams of Enemy Advance. A Dictionary of Etiquette 1914.Duke of Wellington.Earl Roberts.General Gordon.Green Envelope.Homesickness.King Edward Chocolates.Lobby's tobacco.Lord Nelson.Shell Shock.The Listeners' Lounge.